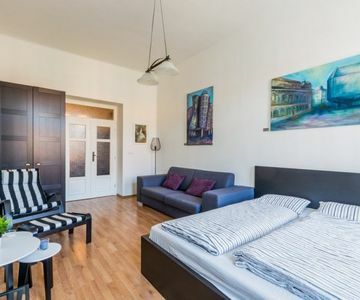 Modern and comfortable apartment situated close to the historic city centre, which is accessible by 15 minutes walk or only 3 stops by tram to Wenceslav Square and Namesti Republiky. Thanks to the location of the apartment one has a unique opportunity to experience special character of Prague central areas and enjoy the old town spirit. The apartment is ideal for anyone who wants to fall in love with Czech Republic! Amenities: 2x bed linen & towels, heating, wheelchair access possible, free wireless internet, elevator, paid parking with garage, 2x mirror, shower, toilet, toiletries, washing machine, hair dryer, cookware & kitchen utensils, dishwasher, electric kettle, microwave, toaster, plates, pans, fridge / freezer, coffee maker, gas/electric hob, table and chairs, shelves, 2x cupboard, complimentary tea & coffee, table, armchair, double sofa bed, lamp, double bed, night table, reading lamps, tv, stereo, iron & ironing board. From the airport: By bus 119 to the stop Sídlišt? ?ervený Vrch or Nádraží Veleslavín, then by tram 26 to the stop Husinecká. From the main train station: 20 minutes walking Tram 5, 9 or 26 to the stop Husinecká. From the bus station Florenc: 12 minutes walking. By bus 133, 175 or 207 to the stop U Památníku.